Campus Advantage has been creating successful student housing communities for over 15 years. As the student housing market continues to grow — catapulted by sustaining returns and thus continued interest among investors, developers and property managers alike — the number of players in the industry has grown, as well. For those looking to delegate their property management, the choices are many. However, we would recommend limiting your search to experienced but forward-thinking student housing managers that have a proven track record for delivering financial success, as well as fulfilling resident experiences that increase retention and lease-ups. 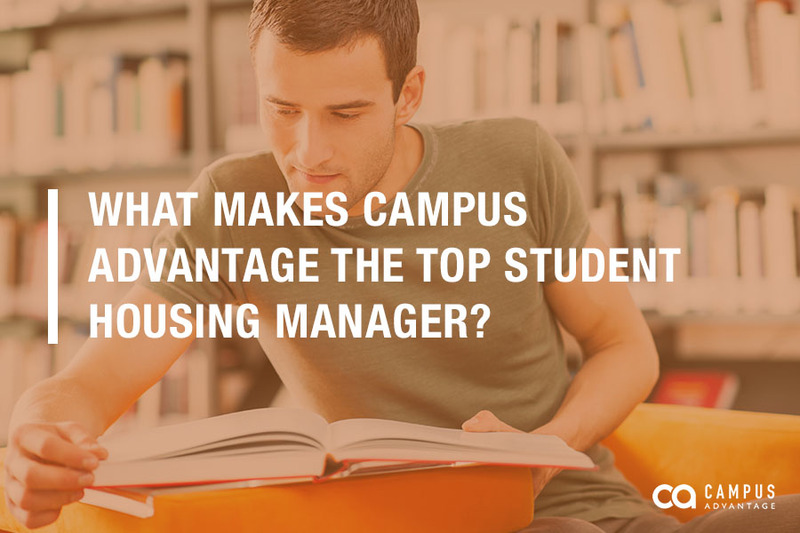 The primary differentiator for Campus Advantage, and what makes us one of the best student housing managers in the industry, is the combination of three operational pillars upon which we’ve built our successful management platform. This triad, which is at the heart of our award-winning student housing management approach, was developed by Campus Advantage in response to common barriers to ideal student housing asset performance. These practices constitute a holistic property management strategy that drives resident acquisition, retention, and ultimately, maximized revenue. Campus Advantage’s full-service marketing partner, Catalyst, offers sophisticated, results-driven strategies for branding and rebranding, as well as campaigns centered around driving resident retention and lease-up. While many promote their properties through channels like search, display and mobile advertising, typically campaigns in these channels are planned and executed independently, rather than planned in a holistic, integrated manner that better attracts attention and consideration from students. Catalyst’s proven integrated, strategic marketing approach includes staying abreast of the generational and channel trends that are important to students and refining strategies on a frequent basis to meet prospective residents where they’re engaging (while never losing sight of best practices). These in-tune methods combine to gather data-backed insights that drive intelligent communications campaigns, building awareness of the property to attract residents and increase foot traffic. At its most basic, Catalyst’s goal is to determine the best message and channel strategy to reach students and then execute successful campaigns centered around these insights. Once a potential resident’s interest is peaked and they make their way to the property, they are met by staff who are equipped with rental rate offers that serve student needs while driving optimal revenue performance. Campus Advantage’s revenue management approach is bolstered by continuous, timely data sourcing — assessing trends in leasing velocity, traffic to the property, market supply, and more. With this data, Campus Advantage is able to set rates that are much smarter than the standard, calendar-driven approach, achieving occupancy goals while driving optimal rent for every bed in every unit. And we do it all at speeds that leave our competition playing catch up. Once students officially become residents, it’s our job to ensure they have multiple opportunities to excel — academically, professionally, and personally — as we create environments that foster student success while being financially profitable through our industry-leading Students First Experience® program. This program is centered around providing residents with living, learning and career experiences that encourage positive, holistic growth while the student is living in a Campus Advantage property. The Students First Experience includes elements like grocery bingo (where students can win groceries from stores in the area), game nights and pool parties, volunteering opportunities, and resume building and job search support – with each activity selected to meet the needs of its specific university environment. Ultimately, these experiences, combined with positive relationship-building between residents and property-level staff, lead to retention and word-of-mouth referrals, helping to drive occupancy for the next year. We know our forward-thinking approach to integrated marketing, revenue management, and residence life works. We’re continually progressing — and that’s entirely due to the hardworking, innovative nature of our Campus Advantage team. It’s our collaborative efforts that continually push the industry envelope, allowing us to take calculated risks that make us a top student housing manager.